Let me state at the outset that I am not on principle an 'anti-vaxer' or 'medical doctor hater'; I am in favor of any independently tested vaccine, thoroughly proven for both efficacy and safety, through studies free of overt financial ties to industry. But the more I study the issues - issues that like you I once thought were totally 'settled' and 'definite' - the more I find that far too many facts just do not add up, and history is not as we have seen it to be. As we still live in a free country, we should be free to consider all of this. There are many people who would deny you that right. Including your neighbors who may be easily swayed by the power of the press. Those who own and control the press know that - and also take orders from their superiors. It is the way of the world, and has always been that way. Once again the subject of vaccination is all over the popular press. Almost like a command sent from on high, and it is in every periodical and news channel in the country, even the world. A relatively harmless disease of childhood is made out to be a major threat to one and all. Remember the Swine Flu of 1976 - the greatest vaccine disaster in U.S. history? No one died of the disease, which never materialized, but a couple hundred died from the vaccine, which was pulled from the market. The same 'imminent threat' propaganda was called upon to sell us on Avian Flu, H1N1, and SARS. They went quietly away also. As one generation moves to the next, history is forgotten. It is scary to contemplate such power that can so easily sway public opinion. To help you understand something of this important topic and not be moved one way or the other solely by propaganda or emotional pleas, the following article was written. There is, of course, more - much more to be said, as some of the issues are complex. But to start I will pose a question. The pharmaceutical companies constitute the second most powerful lobby on earth (with, among other things, an estimated two full-time six-figure lobbyists for each member of the U.S. Congress). They fund the medical colleges and essentially dictate medical policy in this country. If you see the outrageous advertisements for drugs on TV every night, you probably laugh or gasp in shock at the boldness of most of them. Rather than outright lie anymore, these companies dare to list several minutes of dangerous side effects of each of these drugs, including usually at the bottom of the list the very symptom you would be taking the drug for! Now, if you think this is ludicrous, and if you do not trust these companies when it comes to these drugs, then why should one trust them to be scrupulously honest when it comes to vaccines? After all, the same companies are involved here, and money is the name of the game. The reason is that we have been subject to misinformation for a long time, and many true sources of information are dismissed and marginalized. Think about this. Many points discussed in this article are explained further in Part Two. So to start, the state of the medical profession not so many years ago was not exactly stellar. Here are a few examples. The great Dr. Semmelweis was railroaded into a mental hospital for daring to suggest that physicians wash their hands between patients to prevent puerperal (or childbed) fever - one of the major scourges in the 18th and 19th centuries. Delivering babies in hospitals had led to a four-fold increase in infant deaths as contrasted with mid-wife assisted births. This affected literally millions of mothers and infants. Getting doctors to wash their hands had a much greater impact on mortality statistics and the average lifespan than vaccines or antibiotics could ever take credit for. "In 1918, the US Army forced the vaccination of 3,285,376 natives in the Philippines when no epidemic was brewing, only the sporadic cases of the usual mild nature. Of the vaccinated persons, 47,369 came down with small-pox, and of these 16,477 died. In 1919 the experiment was doubled. 7,670,252 natives were vaccinated. Of these 65,180 victims came down with small-pox, and 44,408 died. In the first experiment, one-third died, and in the second, two-thirds of the infected ones died."(Dr. William Koch, The Survival Factor in Neoplastic and Viral Diseases. "A compulsory immunization program was set up in England in 1853 using Jenner's methods. Before that time, the highest number of deaths in a 2 year period in England from smallpox was about 2000 [and it was expected it would eventually burn itself out]. Results of this immunization: 1857-9 (14244 deaths); 1863-5 (20,059 deaths). In response, in 1867 Parliament enacted a stricter vaccination law, and 97% of the people were innoculated. New result: 1868 (44,840 deaths)." (Tim O'Shea, Vaccination Is Not Immunization, p. 16-17). An even greater deaths occurred in Prussia, a country with the highest inoculation rate in Europe. After 35 years of 100% mandatory vaccination and re-vaccination, a smallpox epidemic there killed 124,978 people. There were repeated mass protests against smallpox vaccination in England throughout the 19th century - as large as one hundred thousand people. The town of Leicester held their ground, rejecting vaccination in favor of a carefully conducted policy of quaranteening the sick, and improving public hygiene and sanitation. The result: for fifty years they had only 5% of the deaths from smallpox compared to the communities that vaccinated. This became known as "the Leicester Experiment." You probably never heard of it. I never did. I didn't learn of it the course I had on infectious diseases in chiropractic school. Which is okay, because they don't teach this in medical school either. Or if they do the people of Leicester are made to look foolish, not knowing what they had missed. Or statistics are manipulated to obscure the obvious. Human immunity is an incredibly complex affair, and scientists are continually learning more and more about it. No immunologist claims to known very much about it at all. The whole thing depends on an unrestricted nervous system, and the life force of the organism unhindered by a lifestyle, diet, and environment at odds with fundamental natural laws. Current medical science in general does not recognize these vital principles of natural law. To them man is a physical mechanism solely determined by atoms and chemicals, succumbing periodically to disease caused by specific disease organisms, for which we need powerful drugs or vaccines to combat. The great physicians of our past did not believe such a view. The so-called "Germ theory of disease" only came into vogue in the 19th century with Louis Pasteur - who rejected his own theory on his death bed. He said "I was wrong, Bechamp is right: the environment is everything, the germ nothing." To Bechamp, Virchow and others, disease came first, the germs came later. Germs are more like scavengers, seeking their natural environment. After all, scientists know that we have thousand of 'deadly' microbes on and within us at all times, but only when our vital resources are depleted do we generally get sick. The adherence to the vitalistic principle of natural law is why chiropractic, and homeopathy, had such stellar records compared to the medical profession for mortality among their patients during great epidemics of the past. At the very least, they followed the maxim, "above all, did no harm" - the basis of the Hippocratic Oath that all medical doctors take. But they also believed one should not suppress symptoms, only to trade them for others, or to drive them deeper to cause more serious problems. Don't suppress a fever with aspirin, for instance. It suppresses the body's innate healing ability. Some are coming to believe that the great 1918 Flu epidemic was made much worse by the indiscriminate, heavy use of aspirin. Up to 8 grams (8000 mg) a day was recommended, courtesy of heavy world-wide promotion by the Bayer company (which once sold not only aspirin, but cocaine). This may have caused a less serious illness to develop into pulmonary hemorrhage and other problems. In brief, there are three main components or lines of defense involved. The first is the skin, mucous membranes, digestive and respiratory tracts. A germ must make it past these before the second line of defense comes in. Vaccines entirely bypass this first line of defense by injecting microbes or their byproducts directly into the bloodstream - something that would never happen in nature. This is extremely important. The second component of the immune system is called innate immunity or cellular immunity, or the health of the cell membrane, production of macrophages, white blood cells, Killer Cells, T-lympohocytes, etc.. This system is not dependent on memory, which is why they call it innate. The health of the cell is dependent on adequate supply of key nutrients, among which are vitamins C, A, and D. This is one reason that scurvy was such a devastating disease. The third component is humoral immunity, which is the production of antibodies from exposure to an antigen (i.e., virus). The theory of vaccination is that exposure to an attenuated form of the antigen can produce the same memory of invasion by a disease agent, without going so far as to create the disease itself, as can the natural immunity created by the system as a whole (with literally hundreds of interacting adaptations) to that same microbe. The latter is why any immunity gained from vaccinations is partial and short-lived as compared to the life-long immunity gained after going through the disease. It is a 'theory' because they do not know how or if antibodies actively fight disease. They are a marker that tells if you have come in contact with a disease. Research does show, however, that this is very complex, because in some cases the presence of antibodies can either be helpful or harmful. It is very specific to the individual, and the particular disease. Yet vaccines not only give a one-size-fits-all dose, but this very central tenet has never been proven. There are many problems with the claims made for this theory, such as: (1) the very idea that production of antibodies is the most essential and necessary part of immunity against infectious disease is flawed: Gerald Edelman won the Nobel prize for discovering that this is a gross over-simplification (antibodies - a learned response to the presence of an antigen or foreign agent - are responsible for only 2-15% (estimates vary) of the initial immune response to a bacteria or virus - the reminder is due to what is known as generalized or ‘innate’ cellular immunity); antibody levels are notoriously low or absent in those vaccinated for measles, for example; Dr. Edward Burton proved that there is no correlation between the presence of antibodies and immunity to disease: antibodies are often low in those with full immunity, and high in those with no immunity; children with a genetic disorder in which they produce no antibodies to measles prove to be just as immune as anybody else; (2) vaccination does something that is never allowed in nature, and that is allowing a virus to enter directly into the blood without going through the first line of defense outlined above; the body does not produce a full response to the foreign agent, which can allow it to penetrate far deeper into the bodies tissues, where it may remain for years before doing harm to the patient; (3) arrogantly maintaining that the mercury, aluminum, formaldehyde, etc., in vaccines are not poisons, when of course they ARE; to suggest cavalierly otherwise as pediatricians often do is just plain arrogance if not stupidity: since 1930 four government agencies have declared mercury poisonous - the second most toxic non-radioactive substance on earth, affecting all neural tissue: currently the EPA says 0.1 microgram (mcg) per kilogram of body weight is the maximum ‘safe’ dose FOR AN ADULT - yet the combined dose for an infant on each of the first three well-baby visits alone (per 2005 FDA statistics) is 30x-78x that (or 12-62 mcg) - which puts the lie to the pediatric belief that this most lethal form of mercury (thiomerosal) was taken out of vaccines in 1999, when the FDA, after the CDC’s strong recommendation, only ‘suggested’ that manufacturers remove it - and which all major European countries removed (along with one of the untested-for-safety but widely reported as dangerous ‘triple’ vaccines, DPT - and in most countries, MMR vaccine also) over TWENTY YEARS ago; a major problem being that doses of mercury are cumulative in the brain and other nervous tissue and the effects may not show up for years later - then again, they might induce seizures, encephalopathies, at any time (4) the fact that many of the diseases vaccinated for occur now largely or only in the vaccinated populations (measles, according to the CDC; polio, according to Jonas Salk - heard of him? - the creator of the first polio vaccine, who later said (after he made his money) that “polio would have gone away on its own, we didn’t have any affect on it”. More on this below. The biggest elephant in the room in this debate has so far been ignored by almost everyone: before one can talk about these other important points, is it even the case that the eradication of the major infectious diseases can be attributed to vaccination? ‘Everybody’ assumes this to be true, but, according to official government statistics, IT IS JUST NOT SO! In short, the great ‘medical miracle’ of recent times (late 18th to early 19th century) was not drugs and vaccines, but improved sanitation and hygiene: modern sewage treatment, clean water, and better nutrition (which bolsters the ‘innate’ part of the immune response - not a ‘chiropractic theory’, numbskull, but basic medical science). Don’t believe me - just another lowly chiropractor (with three degrees, but so what) - believe Historical Statistics of the Department of Commerce (1975), or International Mortality Statistics by Alderson (1981) - and you will find that, without exception, mortality from each of the major diseases vaccinated for was 90-95% gone BEFORE vaccinations were introduced in the 1940’s and 1950’s. Metropolitan Life Insurance Company - hardly a source to lie about statistics - in 1948 reported: “…the death rate of diphtheria, measles, and whooping cough declined 95 percent among children from 1911 to 1945, before the mass immunization program started in the United States.” [From their high in the mid-1800’s the decline in whooping cough was closer to 99% and measles nearly 100%!] Here are examples of graphs of mortality statistics for various diseases in Wales and England; similar charts exist for the U.S.A.. In other words then, VACCINATION TAKES CREDIT FOR SOMETHING THAT WAS ALREADY GOING ON. IT DID NOT ERADICATE THE MAJOR INFECTIOUS DISEASES. That much is indisputable, and hardly anybody dares to talk about it. The only remaining question is whether and how much an effect it may have had on any further increase or decrease of these already almost wiped out diseases. The full impact of this may shock you, as it is not taught in medical schools, certainly not entertained in the medical societies, the AMA, APA (pediatricians), nurses organizations, pharmacies, etc. - even though it is plainly evident in the mortality tables. For example, diphtheria: 48,839 deaths in 1901, down to 467 in 1946; measles from 11,956 in 1901, down to 469 in 1946 (to 44 by 1966), whooping cough (pertussis) 33,194 to 1460. Why? Cleaner environment, better nutrition/natural immunity. Measles was down 96% from its peak by 1946, 98% by 1951, and 99% by 1963, when the vaccine first became available, but 99.99% in 1970 when it began to be widely used. Some states, such as Massachusetts and Washington, reported virtually a 100% decline by the mid-1960's. Thus any further decline in measles cases/deaths since the vaccine was introduced is impossible to attribute to the vaccine. Of measles, the CDC now reports outbreaks in 100% vaccinated populations, and the WHO is even on record of admitting (albeit, back in the 1980's) that the vaccinated have a 15 TIMES greater chance of catching measles than the unvaccinated. Yes, things like measles were big killers in times past of poor sanitation, overcrowding, and bad nutrition (your grandparent’s era), and still are in third world countries where these conditions apply - but not here. And while we all cannot help sympathize with people such as the father of a boy with leukemia who is worried that selfish unvaccinated kids in Marin County will transfer measles to his immune-suppressed child, the sad reality is that there is no evidence so far that vaccination with any vaccine, whether whooping cough or measles, can prevent anyone from being a carrier. There is some evidence that it may increase your chances. And no evidence either that measles vaccine prevents measles - certainly not for life. Immunity wears off fairly quickly, whereas going through actual measles as a kid does confer lifetime immunity. What it has led to is the incidence of newer, atypical forms of the disease that can arise in adulthood, for which there is no immunity, and which is then transmissible to vulnerable infants, who previous to the vaccine era rarely got measles. One of the reason for the inherent ineffectiveness of the vaccine are known to immunologists as ADE (antibody-dependent-enhancement) and OAS (Original Antigenic Sin). Ask your pediatrician if he or she has ever heard of these. It is not likely, unless he or she has made an in depth and impartial investigation of the history of vaccination research, and then has the courage to deal with the immense cognitive dissonance that it will create in him or her as to how they make a large part of their living: "well baby visits." I totally sympathize with this position, but must state that this is not only my biased opinion, but the view of many medical doctors who oppose the official paradigm of medical practice today. The major decline of infectious diseases was due to the miracles of public health, and true herd immunity: where a disease burns itself out over time in a population which becomes infected and passes on its immunity through the mother from generation to generation. The medical establishment by slight-of-hand has REFINED what true herd immunity is, saying that it means vaccinating 100% of the population. That is artificial immunity, at best. Listen closely: vaccinations were sold to the public with the promise of lifetime immunity with one shot. When that didn't work, a number of booster shots were proposed. (Any science behind it? Not really. Any science behind the expectation that the LAST scheduled booster will itself provide lasting immunity? Nope). To repeat, by national and international statistics, measles mortality was almost entirely eradicated when they started vaccinating for it. After a number of years, the rate of vaccination went up, and for a while the incidence of measles itself continued on its downward trajectory; but then it began to creep up again. When the vaccination rate reached 85%, and measles kept increasing, they proposed that 'herd immunity' required a 92-95% vaccination rate. And now that we essentially have that - even in Marin - it has not succeeded, and 100% is urged. But to top this off and deliver a mortal blow to the sanctity of the vaccine paradigm, there are numerous reports in the literature of measles outbreaks in populations that are 100% vaccinated! If the vaccine worked, this should not happen. Keep this in mind when you read the daily news that is currently plastered with urgent pleas to vaccinate all of our kids to prevent this and other deadly diseases. If anything, the true "reservoirs of disease" (an Orwellian term) are the vaccinated, not the unvaccinated few, whom the former put at risk. The problem is that: mass vaccination is not true herd immunity, and two, this artificial version of herd immunity does not work. There is more. Of all the vaccines on the market, measles vaccine is notorious for producing few or no antibodies - which means that no one knows how or if it protects one from getting measles. (This is complicated, but there are kids with a condition known as agammaglobulinemnia, i.e., the inability to produce any antibodies, and yet they recover from measles as well as anybody. How? - through the innate cellular immune system which everyone has a first line against disease. 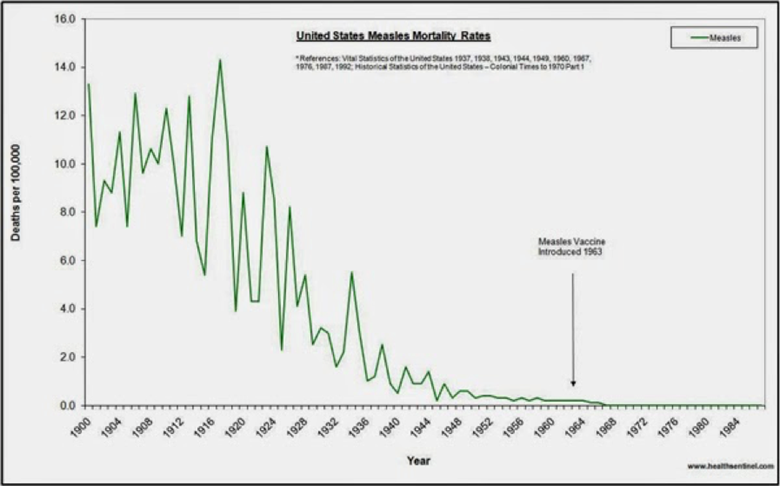 Once again, see the graph to understand that measles mortality was 95% gone BEFORE they introduced the measles vaccine. The same goes for whooping cough - in England the reduction was 99%! But whooping cough incidences are increasing. Dr. Witt, chief of infectious diseases at San Rafael Kaiser Hospital, did a study in 2012 trying to find out why the vaccine wasn't working, and he concluded that after only one year there were only 20% antibodies left (so what next - booster shots monthly?! And of course blame the unvaccinated, anything but admit the failure of the paradigm itself), and not only that, but he found that in all populations, there was a higher incidence of whooping cough in the vaccinated than the unvaccinated. His conclusion basically was: "continue taking it anyway until we figure something out." Nothing like covering your assets and avoiding making waves. Dr. James Cherry found similar problems with the measles vaccine but now publicly calls those who do not choose to vaccinate "really stupid people." This is a travesty, and nothing to do with science. It is little wonder that recent articles like this one report that this year’s flu vaccine - even according to the ‘official experts’ (i.e., marketers) - is 25% effective - and, according to the FDA, may even cause flu in vaccinated persons. Okay, some have said to me, but maybe 25% success is better than nothing. Think of the vulnerable elderly, or helpless infants. [Update 2018: this year's vaccine is claimed to be 25-30% effective, according to varying estimates. We will speak below about what that rate actually means in real numbers]. All right, but there are a few things one must become aware of when faced with such an argument. First, according to the respected Cochrane Collaboration (a global independent network of researchers in more than 130 countries) in their database review, there has been little evidence confirming a benefit from the flu vaccine for these or any other group of people. In 2006 the Journal of the American Association of Physicians and Surgeons found "little or no evidence of effectiveness in preventing flu cases, deaths, or hospitalizations." The Lancet, and the New England Journal of Medicine, both reported vaccinated individuals at greater risk of the flu than the unvaccinated. In 2009 the Lancet reported that "annual flu shots prevent immunity to future strains of the disease." As all strains mutate repeatedly over the case of a flu season this is a serious concern. What they are saying is that flu shots negatively affect your immunity. In 2005 the Archives of Internal Medicine published a report stating that in the United States as of 1980 just 15% of the elderly were vaccinated for the flu, while by 2001 65% were vaccinated, but the death rate from flu was unchanged. Pretty hard to justify protection based on that. On the contrary, quite possibly giving a frail elderly person a flu shot each year could depress his or her already depressed immunity enough that they contract pneumonia - figures for which are often combined with those for the flu in order to inflate the flu mortality numbers to 36,000 each year (instead of the actual figures from the National Vital Statistics Reports which the CDC internally uses and which says there are only a few hundred to a couple thousand flu deaths per year - in a nation of over 300,000,000 people). This annual marketing slight-of-hand by the CDC led even the British Medical Journal (hardly a radical, anti-vaxxer organization) in 2005 to issue a special report confirming from the CDC's own records that the CDC intentionally hyperinflates the flu mortality numbers in order to scare the public and sell more flu vaccine. Ever notice that the flu is always going to be much worse than last year's, or 'even worse than the 2009 swine flu epidemic'? Except that the 2009 epidemic turned out to be no worse than any average flu year; eventually 300,000,000 doses of vaccines were destroyed when the epidemic didn't materialize as planned, and, moreover, after hundreds of pregnant women aborted due to it; and even more outrageous, today (2018) the CDC is broadcasting the absurd claim that 60,000,000 Americans got the flu in 2009, a bald-faced lie and exaggeration of immense proportions. That is close to what they told the public was going to happen when they were rolling out the vaccine, but not even close to what actually happened when the flu season was over. I guess they got away with calling it swine flu again because they figured the public has a short memory and had largely forgotten the 1976 swine flu fiasco - the largest vaccine disaster in American history with several thousand deaths from the vaccine. Flu vaccine was considered high-risk for pregnant women and infants - could it be because of the mercury? - but in recent years it was quietly put back in the schedule with no reasoning or fanfare. Giving a vulnerable child a dose of 25mcg of mercury per year with a vaccine with no proven efficacy or safety until they are eighteen is a crime to humanity. Is it any wonder we now rank 48th in world health? If all that weren't bad enough, the late Hugo Fudenberg, leading immune-geneticist, claims that someone having five or more consecutive flu shots had a ten times greater chance of getting Alzheimer's disease. In addition to all these findings, given that there are over 200 I.L.I.’s (influenza-like-illnesses), that mutate constantly and that may be associated with flu symptoms, the likelihood of a manufacturer getting it right by choosing only one or two viruses (which themselves mutate constantly over the flu season) is slim indeed. Most flu diagnoses are not lab-verified, but only assessed through patient symptoms in a doctor office visit. So no one knows how many people actually have the influenza virus itself. Some may say, who cares if it is really the flu or only looks like it? Well, it makes a BIG difference if you are claiming to offer protection to it through a vaccine! "Therefore, 71 people would need to be treated with the flu vaccine to prevent one case (1/1.4%). In other words, the flu vaccine did nothing for 70 out of 71 who received it. That means this study found the flu vaccine failed 99% (71/72). 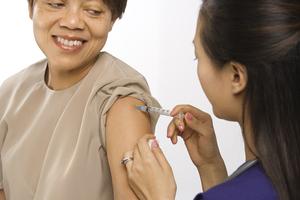 There was more bad news for the flu vaccine in this study. The flu vaccine is touted as decreasing the risk of hospitalizations from the flu. I’m not sure how that happens since the vaccine has never been shown to be very effective against preventing the flu. In this study they found the risk of hospitalization in those that received the flu vaccine declined from 14.7% to 14.1%. That is a 0.6% decline. That means the flu vaccine fails over 99% (165/166) in preventing hospitalizations. Furthermore, the independent researchers found the flu vaccine “…may lead to little or no small reduction in days off work.” To make matter worse, the flu vaccine was shown to cause an increase in fever from 1.5% to 2.3%." A Sutter general practitioner who I needed to go to for an exam told me I was 'resistant to treatment' and 'blowing smoke' when I suggested that it didn't seem to me that the evidence justified getting the flu shot, if only to protect others. I wish I had this article with me when I saw her. "Vaccine propaganda is so mindless and aggressive that anyone who merely cites the printed vaccine insert is immediately condemned as "anti-science," even though the science is perfectly clear that many vaccines are backed by no scientific evidence at all." In addition, adverse effects from the flu vaccine (the big ones being Guillain-Barre, encephalitis, death) result in the largest payouts from the government's Vaccine Injury Compensation Fund (VICP), which has paid out several billion dollars since 1986. There is much more to this, what we have said is just the tip of the iceberg. Here is some more on myths about the flu. Ever wonder what happened to these dreaded killers: plague, cholera, typhoid, or scarlett fever? Gone, without vaccination. (They tried to make a scarlett fever vaccine, but the nurses involved in the study in the late 1940's died horrible, painful deaths. You have to dig to find this in the medical literature, but it is still there. Yet, the disease gradually went away - and like the others, was almost entirely gone by the time the vaccine was tried). How did it happen? Same as the rest: through better sanitation, clean water supplies, and improved nutrition (an essential component of innate cellular immunity), as well as a true herd immunity passed on through generations. It has been said that it takes on average eight years to test and approve a new drug (the kind you really trust after viewing the ludicrous ads on TV every night, which including a five minute list of side effects, usually including at the bottom of the list the very condition you are taking the drug for!). It takes at least a year to produce a new vaccine. Even so, they must be tested for both effectiveness and safety - which includes testing for carcinogenicity (ability to cause cancer). Even COSMETICS must be tested for carcinogenicity. But not vaccines. That’s right, and moreover: the vaccines for H1N1 (swine) flu virus was approved after only 6 weeks (they called it H1N1 after the hog industry complained of it being labelled swine flu); measles was approved after only 28 days; chickenpox after 42 days; and Hepatitis B after only five days! (given to newborns - the USA being the only country in the world to do this - for an adult disease they won’t have a chance of getting for twenty years when and if they become a IV drug addict, and which contains a dangerous 25x the maximum safe dose of mercury for an ADULT, according to the EPA. Infants do not yet have a developed blood-brain barrier that can keep toxins like heavy metals from accumulating in the brain where they may wreck neurological havoc almost immediately or many years later. The answer is complex, but essentially "yes" and "no". Polio remains the ‘third rail’ in the vaccine debate. Image of victims in an iron lung, and a poster child for the March of Dimes in braces and on crutches, still grab at the heart. Almost taboo to question, everyone seems to ‘know' of a relative or someone who suffered from the disease in the 1950’s, and is sure the vaccine wiped out this dreaded killer. But is it true? No one doubts that people suffered, but according to the government statistics previously mentioned, prior to the advent of the Salk vaccine in 1954 polio, like the other major infectious diseases, was already 85-95% gone compared to the early 1900’s. This seems unbelievable, as we were taught the exact opposite. But it is so, according to government statistics. It was also a disease that, compared to the other infectious diseases, was rarely fatal, with 95% of cases asymptomatic, and only a fraction of 1% resulting in paralysis. How can this be? It’s certainly not what we were told. What really happened was the creation by the media of the ‘perception’ of an epidemic (a tactic to be later tried with Swine Flu, SARS, and H1N1). In the case of polio this was possible because before the vaccine many related conditions were statistically lumped together as one (including Guillain-Barre syndrome (GBS); viral or aseptic meningitis; spinal meningitis; transverse myelitis; acute flaccid paralysis; enteroviral encephalopathy; chronic fatigue syndrome; Coxsackie and Echo viruses; Reye’s syndrome; lead, arsenic, and DDT poisoning; and traumatic neuritis) which resulted in an over-reporting of polio. There was plenty of morbidity and mortality during the preceding century from all of these causes. But wild polio was beginning to burn itself out. Some researchers believe something may have potentized the polio virus during these decades, perhaps arsenic in farm compounds such as fertilizer; indeed, polio was once known as 'summer diarrhea", occurring like clockwork during harvest time. In the late 40's and early 50's there seems to have been another dramatic potentization that made this relatively benign entero-virus more virulent. More on this in a moment. Add some high-profile paralysis cases - such as President FDR, who some competent scientists now feel most likely had GBS, not polio (Goldman, et. al., Journal of Medical Biography, vol. 11, 2003) and a panic was born. Scientists involved in the Salk trials themselves admitted that only one in six cases may have involved actual polio. So even with the famous epidemic, actual polio cases, historically, had been reduced by 95%. Keep this in mind. A few cases of the most extreme form of polio, bulbar polio, with children in iron lungs, were used for dramatic effect to increase public support for a vaccine campaign. AFTER the vaccine was introduced, however, reporting standards were tightened and only lab-verified polio virus was counted, which gave the appearance of a further decline of the disease, but was just statistical jugglery. What puts the kabosh, imo, on the polio vaccine argument is the fact that Europe had a similar long-term decline in polio cases, followed by a rise and fall in the 1950's, without EVER using the vaccine. This much is irrefutable. So how does anybody know that millions were saved by the vaccine? Prior to 1955, all cases of paralysis, even for 24 hours, were considered to be polio. After 1955, only residual paralysis lasting more than 60 days was included. Actual lab-testing for the virus routine only after 1958. Before these two innovations the case for polio had been dramatically inflated. In addition to the statistical skewing mentioned above, the common practice of splinting and casting paralyzed limbs (for 3-6 months, and up to 2 years in some cases), and the more barbaric cutting of ligaments, was in itself enough to cause flaccidity and paralysis even with completely intact motor and sensory nerve pathways. It was famous Sister Kenny who bucked the pharmaceutical-vaccine-medical monopoly with a ground-breaking physical therapy treatment that put an end to these damaging procedure, which had increased the statistics of polio morbidity. This factor alone should not be underestimated in artificially inflating an apparent success of the polio vaccine. Morris Fishbein, the czar of the AMA for twenty-five years, hated Sister Kenny, but fortunately the common folk like you and I prevailed, and her methods are in wide use today. Many researchers believe that a sudden uptick in paralytic polio cases in the early 1950’s was due to the massive spraying with DDT (a potent neurotoxin, that disrupts the intestinal mucosa, enhancing the the release and multiplication of polio virus which is normally a benign entero-virus). This insecticide was used everywhere, including on populated beaches during the busy summer holidays. Although only mentioned here as an afterthought, this theory has been thoroughly examined and has merit. Graphs for both the U.S. and the U.K. charting the course of DDT use and polio incidence overlap almost perfectly. Once again, prior to DDT, crops were sprayed with arsenic compounds, which has a similar effect. The problem was not so much the wild polio virus in itself, but the toxic chemicals that activated it. (Note: arsenic used in the treatment of congenital syphilis also produced polio-like symptoms). In science, association is not the same as causation. In other words, an association of a rise in DDT use and a concurrent rise in polio cases does not prove causation; there could always be other factors that also were on the rise that are the actual cause. But it does make it worthy of investigation. In the case of polio, however, if you couple these statistics with, as mentioned above, the fact that European never mass-vaccinated for polio, yet experienced virtually the same rise and fall of polio cases as in the US, which did vaccinate, then the vaccine hypothesis as responsible for the decline of polio is certainly thrown into doubt. Currently, with WHO pressure and Bill Gates’ money, there is an effort going on in India to eradicate the wild polio virus by any and all means. In some provinces children have been given as many as THIRTY-TWO DOSES of polio vaccine buy the age of five, an unbelievable amount of toxic mercury and a huge assault on the child’s innate immune system - the most important part. And what is the result? A 25 to 35 TIMES INCREASE in paralysis cases. This is not only polio, but ‘acute flaccid paralysis’ (AFP), vaccine-induced. When one round of vaccine fails to produce a cure, the response is “give them more until all polio virus is gone” - who cares what they are dying from. Within the vaccine paradigm, the goal is to eliminate the virus, not actual cases of paralysis, i.e., the disease. It has been this way since the Rockefeller Institute’s supervision of the Salk trials. It may not be a conspiracy, but only the way the world works. The third world has always been a dumping ground for the vaccine stockpiles of the pharmaceutical industry. Many people in such countries protest this practice as they see the handwriting on the wall with themselves as Guinea pigs. By the way, Bill Gates seems to have a strange view on the purpose of vaccines. Check this out. I dare you. It is not widely known that there are 30,000 cases, with 1400 new cases, of AFP in the US each year. According to the NIH the causes are: “viral infection, immune reaction, and vaccination.” Is anyone listening? This is not a laughing matter. Ever think of why booster shots are said to be needed? Consider this: if vaccines worked like they initially were supposed to - giving you immunity for life, just like the natural immunity one acquires from having the actual disease in childhood - why a need for boosters? Because they DON’T work. But, even if they did, how by any stretch of the imagination can anyone profess to know that the last scheduled booster for your child will last for a lifetime - or, at least, longer than any of the rest of them? Answer: they don’t know, this is just a guess - if not an outright lie. The concept of booster shots has never been tested. Coming from the horse’s mouth, the words of these notable men make the pediatric profession look rather silly in belittling and demonizing parents, chiropractors, medical doctors, and others who raise legitimate questions about vaccination. In the face of difficult truths, when the brain numbs out, or the eyes glaze over, it takes courage to be strong, investigate, and know that perception is not always reality. And that poor little poster-girl? She walked without braces through the help of her chiropractor after six months of adjustments. Really. Does this mean chiropractic cured polio? No, not exactly. What it means is that in this case someone who had polio (or, quite possibly some other form of paralysis thought to be polio) was restored to normal neurological function through chiropractic. This is just getting our feet wet on vaccination. I urge you to research and investigate this subject for the sake of your health and your children’s health. Do not put this responsibility off on some authority figure; do not be afraid to question. Doctors, well-meaning and not, mostly repeat what they were taught in medical school, which is highly influenced by pharmaceutical company money. This is big business, which must be protected. When in actual practiced they rarely take the time to study further. Unvaccinated kids in developed countries, all things being equal, are almost always healthier than vaccinated kids, with less asthma ( a new epidemic), allergies, immune disorders, and childhood cancers (seriously on the rise). Because their immune systems are not suppressed. Are vaccines tested for carcinogenicity? No, yet they contain known carcinogens. And the symptoms of mercury poisoning are no secret - a myriad of neurological disorders. That is why Europe banned its use. That is why the EPA says it is a deadly poison. The number of vaccinations given oil the U.S. has tripled in the past twenty years: 68 as of last counting - with a couple hundred in the pipeline. In as few years the rate of autism has gone from 1 in 3000 to an shocking 1 in 58 (! ), yet doctors here insist there is no vaccine connection, or even a reason to investigate whether or not there is. No European country has anywhere near this increase. Hhhmm…. maybe that is because they don’t use thimerosal, or give the DPT shot, or the measles (the first 'M' in MMR), or vaccinate new borns (Europeans waiting at least a few months, while Japan stopped vaccinating before the age of two in 1979 and the incidence of seizures there went way down) - ? When vaccine promoters confront statistics like those for autism, they often take the easy way out and fall back on the ‘genetic argument’. “There is a ‘genetic epidemic’ of autism,” they say - something that never happens - changes in the gene pool generally take hundreds of years. Whenever there is no drug for something, it seems the cause must be genetic. Nonsense! No testing has ever been done on the safety of trivalent (three-in-one) vaccines, such as DPT or MMR. For either accumulative heavy metals or accumulative viral load. But field reports are unanimous, for instance, that in the DPT vaccine the incidence of neurological complications such as encephalopathies, seizures, etc., are way more than if only DT is given. This is common practice in Europe. Why not here? And why, if even the manufacturers, and the Merck manual, a bible for physicians, state that if there is any incidence of these in the child - or the family - the DPT shot should never be given. Yet, pediatricians here snub their nose at the rest of the civilized world and routinely do not screen out these patients. They glibly assert that they do not see any risk. The rest of the world does, but they do not. And based on what? Ask them why they don't screen their patients. Am I saying that NO vaccine works? No, I am not. Chickenpox may ‘work’ - but at what cost? We may be better off getting chickenpox like we all did in the 50’s, a mild illness for a week or so with lifetime immunity conferred. Instead, adults are now getting an atypical form of chickenpox, which is more serious. Childhood chickenpox was a right of passage for our developing immune system. Likewise, childhood measles has been associated with a lowered risk from some cancers. The immune system gets primed for life through going through some of these diseases. It doesn't need a lot of help from outside. Such artificial 'help' suppresses our immunity, possibly leading to the current epidemic of allergies, asthma, auto-immune disorders, and cancer. So even if measles or chickenpox vaccine 'works' it may not always be such a good thing. There are reportedly more cases of shingles now than ever: an amazing one in three adults if you believe the ads from CVS or RiteAid - which I don’t. Why would I say this - because I treat shingles? No, but I see more people than most and should have encountered more than a handful of cases by now, but in thirty years, it has only been two or three. Until recently I was in doubt on the issue of shingles, but recently it has become clear - from medical sources - what is happening. The expert pro-vaccinators, such as James Cherry, MD, and others, have warned of a coming '50 year shingles epidemic'. Dr. Cherry says we may soon have to repeatedly - perhaps yearly - vaccinate adults for chicken pox, in order to prevent shingles. What is the reason for this? Shingles used to be relatively rare, a consequence of a late-in-life waning immunity to chicken pox which can cause the dormant chickenpox virus to activate and manifest as shingles. In times past, almost all kids got chickenpox and thereby received lifetime immunity from it. They have now found out that this is not necessarily lifetime immunity, but maybe thirty or forty years or so. Adults, however, used to be constantly in contact with others, including kids, who have or had chickenpox, which served to 'reactivate' the adults' own immunity - which prevented shingles from manifesting. Since 1995, however, when vaccination for chickenpox started in earnest, natural immunity to the illness has been waning, and artificial immunity from the vaccine is short-lived. This is causing entire generations of adults to be much more susceptible to shingles than ever before. Shingles is painful, and can last for a few weeks, or many years; it is five times as likely to result in hospitalization and three times as likely to result in death (for adults) than chickenpox. So with vaccination in exchange for avoiding the 'one week nuisance' of chickenpox as a kid, we have created both a new, more dangerous atypical adult form of the illness, and an epidemic of the much more serious disease, shingles. A nice deal with the devil. This may be only my hunch, but it may be that any significant assault on the immune system, and not only the waning of immunity to chickenpox, can re-activate the dormant chickenpox virus and cause an outbreak of shingles. A friend of mine who is a nurse at Marin General Hospital was forced to take a flu shot and got shingles a few days later. Of course this is anecdotal evidence only, but one will have a hard time convincing him otherwise. It is likely the experts do not know all of the reasons why this can happen. But don't worry, they have a shingles vaccine, Zostavax, to fix the problem caused by the chickenpox vaccine! A couple of problems: reports find that it is possible to get shingles from the vaccine, as well as transmit chickenpox or shingles to others by it. Further, "duration of protection after vaccination with Zostavax is unknown." [see Shingles Epidemic for more on this]. While we're at it, why continue to give our kids six doses of diphtheria vaccine? The disease is gone; in 1980 there were only 5 cases in the entire country; by 2001 there were only 2 . Oh "because it might come back." But even when the mass vaccination campaign started in 1946 it was already 95% gone, and it is doubtful the vaccine made any difference. . And it has been easily treated for years with erythromycin. Same with wild polio virus - gone in the U.S - the government agencies say so. We stopped vaccinating for smallpox (70 years after England did), why not some of the others? And relieve our kids from the known toxic load of mercury, aluminum, formaldehyde, ethylene glycol, diseased animal tissue, and viruses with unknown mutations cultured on dead animal tissue - none of which has been tested for long-term safety. Just think: over 2000 medical papers discuss the problems with cumulative viral load (such as may re-combine from triple vaccines, such as DPT and MMR, or just getting many at one office visit), with serious unknown consequences to the human genome, yet the vaccines are never studied for this danger. Yes, the 'science' is far from 'settled'. Sweden stopped vaccinating for whooping cough (pertussis) in 1977 after a study of 700,000 subjects indicated there was no need for it, that the vaccine was an unacceptable risk, that the chance of contacting the disease was statistically zero - or 1 in 13,000,000 - even without the vaccine - and NOTHING happened; there has been a small uptick in cases, but they are mild and self-limiting, conferring life-long immunity, and no one has died from it. Germany, France, Japan, and Australia followed suit. This flies in the face of scare-stories told by the medical establishment that there would be a new epidemic killing thousands if vaccination were stopped. Open your eyes, people and doctors. We have gone from #1 to #49 in infant mortality, our kids are sicker than ever. Something is wrong with our health paradigm. We now have, give or take, 68 vaccines mandated for school children. Just before 911, it was in the 30-ish range. These vaccines have been fast-tracked into the schedule, in some cases for diseases that are the remotest of a risk or future risk: Prevnar, Rototeq, HiB - or Hep B for kids. This means no clinical trials, just minimal in-house testing (the 'fox guarding the henhouse', as the FDA tests NO drugs or vaccines, relying entirely on the pharmaceutical companies own data for their stamp of approval), then release them on the public and see what happens. You can’t tell me we are better off and need all these vaccines, rapidly added into the schedule and en masse mandated by schools, to protect our children's health. As stated, Europe is still down in the lower-end range - and usually not mandated either. Are we smarter than they are? According to an IOM (Institute of Medicine) report, as published in the Journal of the American Medical Society, medical error and prescription drug use are responsible for over 225,000 deaths per year - over 100,000 from CORRECT drug prescribing; another 100,000 from hospital errors, infections, and unnecessary surgeries - with an additional 100,000 from out patient visits. This makes it the third leading cause of death in the U.S.. I would hardly call this acceptable. A more recent report gives even greater numbers. And with official rankings having us 49th in world health - down from #1 or #2 a couple decades ago - it is hard to agree with the position that our experts know more than they do...? A big problem, as I see it, is that the pharmaceutical giants, by their own reports, have dozens more vaccines in the pipeline, ready to be tried out on our kids. Paul Offit, MD is on record as saying “even ten thousand vaccines is fine for kids to have.” That is not science, but a ludicrous assumption from this vaccine spokesman - and also a patent-holder for the measles vaccine. Something is wrong with our health paradigm.